This is one item that I would put on the table during Western and Chinese festive seasons. My family members do not fancy five spice powder. 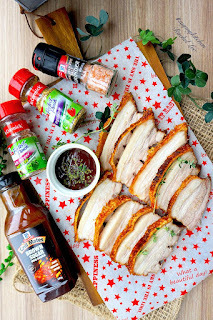 For this, I love McCormick's seasonings for the convenience and flavours that they bring to this dish, making it so palatable and well received. 01. To clean and prep the meat, rub a little salt on all sides of pork belly and rinse with water. 02. Pat the entire pork belly slab with paper towel till dry. 03. Use a needle tenderizer to keep poking on the surface of skin. Do not have to poke too deep into meat. The scoring process would enable more crispy skin. 04. Rub seasonings evenly on all sides of the pork belly slab. 05. Chill seasoned pork belly slab in refrigerator overnight (or at least half a day). Do not cover. Skin face up and keep dry. 06. Allow meat to return to room temperature before cook. 07. Rub McCormick Himalayan Pink Salt on skin only. 08. Air fry pork belly slab at highest temperature of air fryer for 10 to 20 minutes to seal the flavors and juice into the meat (E.g. 250C for 10 minutes; 200C for 20 minutes). 09. When time’s up, adjust air fryer temperature to 180C for 30 minutes. 10. After 30 minutes, continue to air fry at 200C to 220C for another 10 minutes. The skin would crackle and pop by then. 11. Remove from air fryer. Allow to rest for 15 minutes before slice. 12. To prep dipping sauce, blend all sauce ingredients and heat in saucepan.